In our daily life, we often come across products in packages, be it in a nearby grocery store or on the shelf of the shopping mall department. During the production process, every product goes through certain stages, where packaging is the final, yet the most crucial phase. Based on the packaging design, many of you will be making their choice later on, when the product is delivered to the actual distribution point. On Exapro, cellophane wrapping machines are part of the Packaging-conditioning category. Cellophane wrapping or overwrapping is a needed step to make sure the item is protected from external damage. Overwrapping is usually applied over the item or over another form of packaging (box, container). Cellophane wrapping not only improves product visibility but also enhances shelf life. The wrapping process is very low-cost in terms of energy and material usage. Thanks to its versatility, overwrapping is widely applied in a broad range of industries, especially in the field of consumer goods. To successfully overwrap the end product, it should have flat sides to be properly sealed. This way of packaging is usually called gift wrapping or tuck-and-fold wrapping. To easily open the package, a tear tape is used to provide instant access to the product. 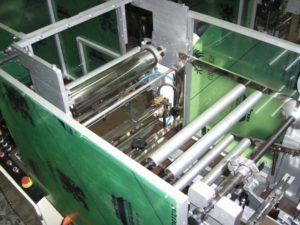 How cellophane wrapping machine works? What is going on inside of a wrapping machine? The mechanism inside of the machine takes a certain length of clean film which is sensitive to heat and can be sealed. The film is then rolled and folded the final product. With a cellophane wrapping machine you can overwrap a single product or a bundle of products at one go. The film which was folded around the product is finally sealed and closed using heated sealing devices. To make overwrapping process work smoothly, the packaging material should be rigid enough to fold and crease, yet no to flop. Is cellophane needed for wrapping? Although called cellophane wrapping machines, overwrapping equipment doesn’t always work with cellophane. Actually, cellophane is not commonly used in overwrapping. Cellophane was at the pick of its popularity before World War II. The word cellophane is a combination of two: cellulose and diaphane (meaning transparent). Packaging machinery first started off using paper or waxed paper as overwrapping materials. Cellophane represented a break-through in packaging due to its water-proof qualities. However, after World War II scientists experimented with various by-products of oil and petrol and in the end celebrated success inventing polymers which could be used as packaging film. Before your purchase, consider what kind of products you will need to overwrap and how wide the wrapping foil should be to perform this action. The output or capacity of cellophane wrapping machine will depend on how many items you need to wrap per day / work cycle. 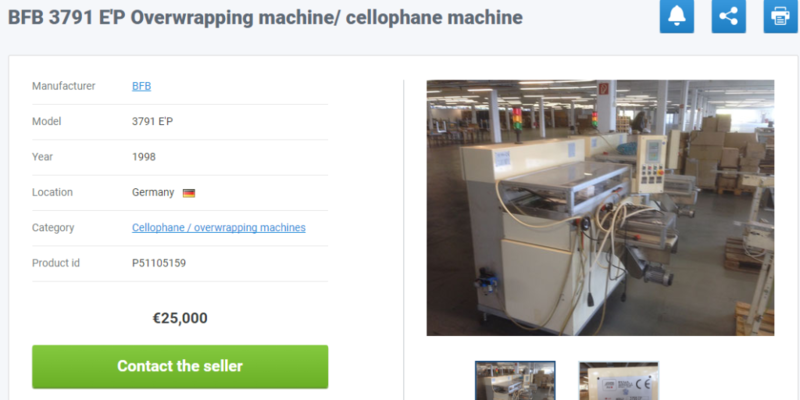 Here are examples of offers you can find on Exapro for used cellophane wrapping machines. Wrapping machine produced in 1998, yet in a good condition, now located in Germany. If you click on the picture, you can visit the product page directly and send your inquiry to the seller of this machine. The following overwrapping machine represents a popular model 18 by Sollas. 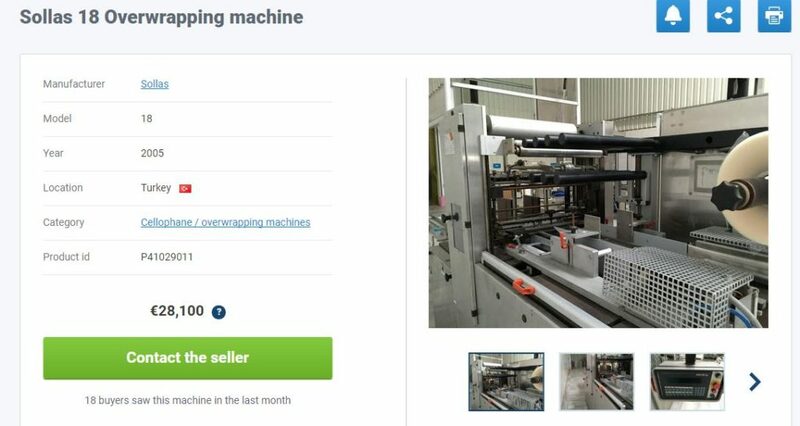 Since machine is in good condition and equipment is slightly over 10 years old, the price of this machine is a bit higher – 28’100 EUR. How to Import a Machine From Turkey to Abroad?